With 60% to 80% of airport website traffic coming from people using smartphones, there has never been a more urgent time than now for airports to embrace mobile friendly web design. To find out how airports are faring I’ve again compared 100 global airports on how mobile friendly their websites are (in short: is their website designed to work nicely on a smartphone?). The good news: In my 2016 comparison, 33 out of 100 airport websites failed the mobile friendliness test (Vs 40 in 2015). In 2017 there’s been a huge improvement. Twenty of those 33 airports have now developed responsive or adaptive websites that are no longer an absolute pain to browse on smartphones! The bad news: While most of the mobile friendly websites are at least friendly in the sense that they now display clearly on mobile devices, very few do anything to make the mobile experience unique or better than the desktop experience for users. As I pointed out last year, it’s one thing to be mobile friendly but something very different to be traveller friendly at the same time. 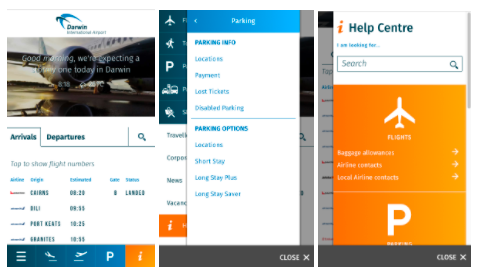 There’s been little innovation or improvement in making mobile versions of websites specifically for people who are at that very moment travelling to or from an airport, or are inside one. 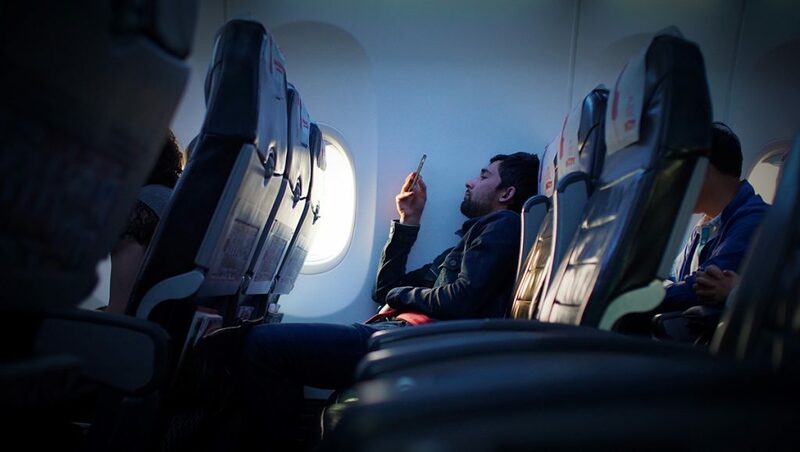 With more than 60% (sometimes as high as 80%) of airport visitors using smartphones to access airport websites, factoring in how well your website serves these customers must be a priority. That number will continue to rise as smartphones become widely available to people previously without access. As will access to cheaper travel. And let’s not forget that their expectations around what is a premium mobile experience isn’t shaped by other airport websites – it’s defined by their use of non aviation industry websites that are pumping significant energy into creating world-class experiences. The biggest improvements I saw this year were from airports in the USA, of which 7 out of the 20 released a mobile friendly website. Three of those are big name, high traffic ports serving in excess of 40 million passengers, so it’s great to see them make an effort to improve customer experience. Darwin Airport, which serves over 2 million passengers each year, might be one of my favourite improvements. It’s quick and easy to access important information like flights and transport with one hand while walking through a terminal. I also really like the welcome messaging with weather that sits just under the header. While simple, it’s a nice touch that gives the small airport some personality that also benefits the user. The icons across the bottom, which feel a little like an app, also make navigating the website a breeze, as does the menu system which is layered until a selection is made. This sped up the process of finding information.I’m a little biased, but Australian and New Zealand airports have been creating some of the best online airport experiences out there over the last few years. Check our Perth, Adelaide, Auckland, or Queenstown (one of my projects) for example. Airports in Japan also showed big improvements with many of the major airports there now offering mobile friendly websites. Japanese web design has always been very different to western web design so it’s encouraging to see airports there now catering for an international audience. 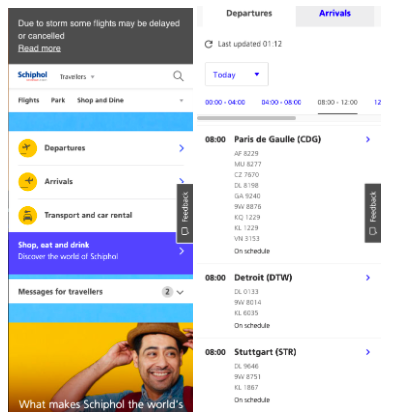 Schiphol Airport is another fine example and my minor grievances with it when it was first released (hard to browse flight information) look to have been solved. The worst offenders continue to be airports with passenger traffic in excess of 30 passengers a year. Only 2 of the 5 the big players, airports with excess of 70 million passengers that didn’t previously have a mobile friendly website, added one. That’s a shame because these airports have the means to make it happen. Geographically, those airports still without a mobile friendly website were all in North America or Asia, with the exception of one. Airports surveyed: I compared the same 100 major global airports with passenger traffic ranging from 2 million to over 90 million passengers a year. Passenger traffic numbers are from 2014. Main photo by Javier Cañada on Unsplash. 0 Comments on "2017 Mobile friendly airport websites report"